Perhaps because New England winters can be so long and gray, I have always been drawn to color and texture, particularly in yarns–my passion. Sometimes, I crave the bulky knits in bold colors to brighten the neutrals we often wear during the winter months. At other times, I seek out frothy pastels that remind me of spring. And my desire for beautiful color and texture isn’t limited to the winter months. Regardless of the season, I’m drawn to accessories that make me feel confident and attractive, fun and flirty. to share these exquisitely handcrafted handbags, scarves, and other accessories with you. I design and create them using the most luxurious fibers available. to keep the art of knitting alive! 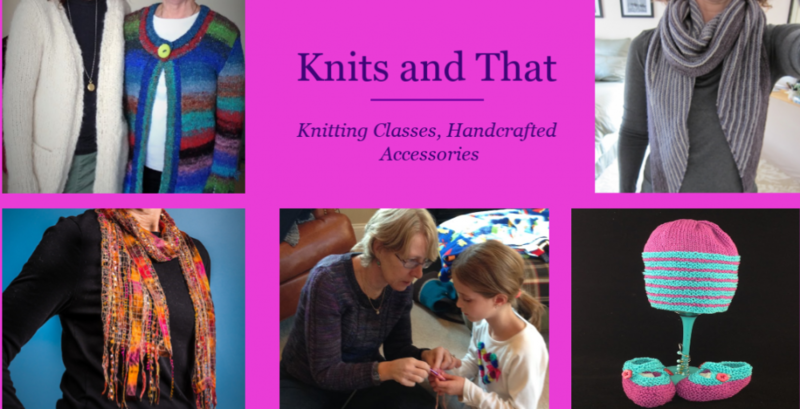 I have over 10 years of experience teaching knitting to adults and children. There’s nothing more exciting than wearing a garment or accessory knit with your own hands. Working with yarns from around the world has allowed me to satisfy my passion for color and texture. I hunt for the softest new wool from Peru, scrumptious cashmere from Italy, and wonderfully hand-painted silk blends from Japan. I use yarns in a wide variety of color palettes to express any mood, whether it’s bold and beautiful, or soft and romantic. When creating these artistically handcrafted accessories, my goal is to make you feel alive, carefree, and beautiful. Why not carry a handbag that expresses your mood and let’s you stand out from the rest.